If the brains behind the Terminator movie franchise ever decide to throw a few robotic killer snakes into the mix, the prototype Eelume looks like it could wriggle its way into any director’s good books. With glowing red LED ‘eyes’ and a flexible, serpentine body that easily cuts through the water, the Eelume makes an undeniably nightmarish (or distinctly cool, depending on your bent) first impression. However, rather than sinking artificial fangs into ocean-going prey, this bot has been developed to assist offshore teams in safely undertaking underwater intervention and inspection tasks. The Eelume was developed by Kongsberg in cooperation with Statoil and Eelume, which was founded in 2015 as a spin-off team from the Norwegian University of Science and Technology (NTNU). Approximately a decade in development, the Eelume bot is designed to reside permanently underwater, thereby sparing companies the expense of repeatedly hiring dive support vessels and diver squads – as well as the effort of having to continually launch and retrieve ROVs and AUVS for separate missions. 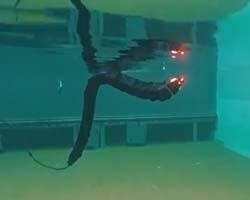 The Eelume has also been developed with a flexible body; this gives it the ability to enter hard-to-reach and confined spaces within underwater and subsea structures, as well as to snake past objects it may encounter. When the bot is ready for long-distance cruising to its next location and mission, its body straightens out again, torpedo-style, for a journey with minimised drag. The modular nature of the Eelume’s body also enables operators to add and remove various joints, thrusters and payloads, depending on the task at hand, as well as to mount different types of equipment, such as torque tools, grippers and maintenance tools. Cameras can be added along the bot’s body, to relay an all-round view of its surroundings to the operator. By removing the need for the presence of support vessels on the surface, the Eelume could also play a role in reducing the operator’s impact on the environment, Kongsberg reasons. The prototype version of the bot, which was unveiled at this year’s Ocean Business show in Southampton, UK, features a length of 1.2m and a body diameter of 180mm, weighs less than 30kg and is capable of descending to depths of 500m. While various payloads can be added to the Eelume, Kjorsvik estimates that “there is a practical limit for how long the Eelume can become before it is troublesome to handle – potentially around 5-6m”. Notwithstanding further system development, “current speed for the prototype is 4-5knots,” he adds. “The vehicle itself is built to reside subsea, meaning it will not be limited by sea state. It can be controlled from any location in the world that has a decent network connection.” The finished Eelume will also incorporate emergency capabilities for vehicle recovery and relocation in the event of a breakdown or error. The next two years are set for further testing and validation and, Kjorsvik says, the Eelume should be market-ready in 2019.